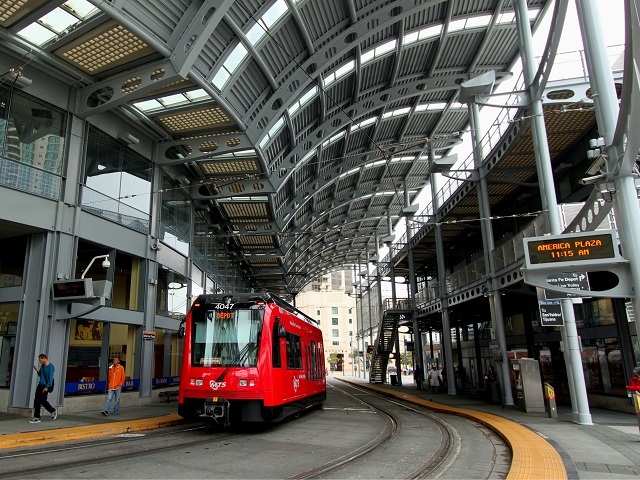 The San Diego Metropolitan Transit System (MTS) is partnering with the private sector to use the Internet of Everything to improve the rider experience. Photo by Prayitno/Flickr. With the arrival of new and powerful technologies, and the declining costs of these technologies, some new possibilities are emerging for cities and their transport systems. For example, the Internet of Everything (IoE) can benefit cities by connecting people, processes, data, and things as “everything” comes online. This is creating unprecedented opportunities for organizations, individuals, communities, and countries to realize dramatically greater value from networked connections—including economic growth and improvements to environmental sustainability, public safety, the delivery of public services and productivity. The potential here is for cities to become truly transformed. What are some of the specific ways that the Internet of Everything is changing cities? Here are three stories that demonstrate the opportunity. On a daily basis, Metrolinx, a government agency of Ontario, moves an average of 271,000 people via their mass transit system. With the opening of Union Pearson Express, a rail link between Toronto Pearson Airport and Union Station, Metrolinx wanted to incorporate digital technology to make this a high quality express rail service. The Union Pearson Express opened in June 2015 with free passenger Wi-Fi, onboard infotainment, and onboard fair collection and validation. Leveraging advanced IP Command and Instant Connect technology, Metrolinx has consolidated all voice over IP calls to the control center. They have also integrated all passenger intercoms and public address systems. But that was just the start. They are currently designing full on-board end-to-end network infrastructure to support all operational and passenger systems including CCTV, Public Address, Fare Collection, Infotainment and visual next stop announcements. As part of the second phase of their digital transformation, Metrolinx is investigating the feasibility of implementing a private carrier-grade fiber network infrastructure to support signaling, communications, Passenger Wi-Fi, track-side telemetry, and supervisory control and data acquisition (SCADA) systems. Many of the most interesting experiments build on public-private partnerships (PPPs) between local agencies and the private sector. As outlined in a recent report from a program organized by the non-profit Meeting of the Minds, PPPs in transport are already having a real impact. For example, Ireland-based tech company Davra Networks is working with the San Diego Metropolitan Transit System (MTS) to transform the rider experience. As San Diego’s local provider of bus and light rail vehicles, San Diego MTS covers approximately 3,200 square miles and serves nearly 100 million riders every year. Striving to improve the quality of service to their riders, MTS looked to provide them with accurate, to-the-minute, next train arrival information. To increase the accuracy of information and improve customer experience, MTS partnered with Cisco and Davra Networks for a combined solution. Currently, MTS is building out an optical network and will be testing Industrial Integrated Services Routers to give them real time GPS of the trains. With these Industrial Integrated Services Routers and Davra’s RuBAN platform, MTS will track the positions of their trains in real time, all while sending data seamlessly to over 200 digital signs across MTS train stations. This combined solution will give riders access to accurate information and data like never before. Every day, logistics companies move, track, and stow millions of shipments. As each shipment moves along its journey, it is touched by numerous machines, vehicles, and people. Making sure that goods arrive in time, at the right place, and intact—this requires knowing where everyone and everything is. That is a tall order. One of the world’s three largest movers of urban freight, DHL has been working to improve this process. One way they’ve attacked this problem is by dramatically improving the day-to-day, minute-by-minute decision making that occurs inside warehouse operations. The idea here is simple: Reducing the number of truck rolls, reducing carbon emissions, reducing the number of vehicles needed: all of this can happen if and when DHL changes the way it starts the delivery process. Using a technology known as Connected Mobile Experiences (CMX), DHL tracks the location of all people and assets along the supply chain in real time. The high-density wireless network collects aggregate location data on the Wi-Fi connected devices that include pallets, packages, conveyor belts, vehicles, and more. Connecting pallets will be a driver for smarter inventory management and the tracking of goods becomes faster, more accurate, predictive, and secure. New kinds of connections will make warehouse operations more efficient and ensure a safer work environment. Connected cameras can detect damaged goods. Visibility into inventory levels will prevent costly out-of-stock situations. Telemetry data from vehicles will enable predictive maintenance. Sensors on forklifts and pallets can help prevent accidents. Connecting delivery personnel with surrounding vehicles and people generates an opportunity to monetize and optimize the return trip to improve efficiency and service in the last mile delivery. This data will improve overall decision making in warehouse operations with real-time data analytics. It also enables DHL to provide faster, more reliable and cost-effective services for their customers. With the advent of IoE, Internet connections now extend to physical objects that are not computers in the classic sense. A connected package for example, will be transmitting info in real time which tells its owner the whereabouts and condition of their shipment. A connected truck can intelligently predict its own maintenance needs. A connected street light can sense the presence of cars and send environmental intelligence to drivers. These are just some of many intriguing possibilities for IoE in logistics. These three stories show how cities and the private sector are leveraging the IoE to connect people, process, data, and things across their entire supply chain to speed efficiency, accuracy, and ultimately customer satisfaction. Real-Time Transit Data Is Good for People and Cities. What’s Holding This Technology Back?